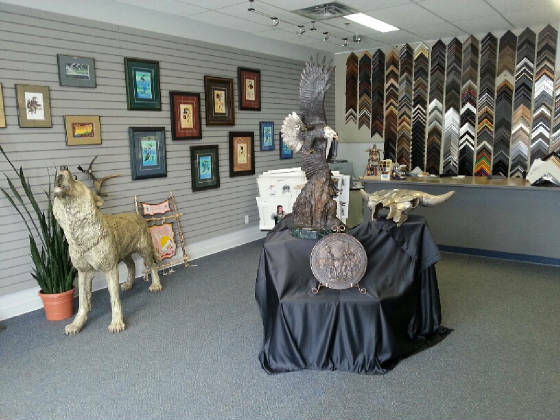 Have your commercial and personal artwork, certificates, keepsakes, memorabilia framed by the professionals at Scoles Fine Arts located in Saskatoon, Saskatchewan. Our Custom Frame Gallery offers a wide range of beautiful moldings, mattes, glass and top quality services at an affordable price. We also offer Special Pricing to Corporations based on volume. Scoles Fine Arts has been providing Custom Framing since 2000. Our Gallery and experienced professional team can assist you in designing the ideal treatment for your corporation, hotel, office, gallery or home. Our products are hand crafted locally using the highest quality moulding and materials which we offer at a very competitive price. Whether redesigning a space, commemorating an event, motivating your employees or appreciating your clients business, we can assist you in finding that perfect artwork or custom frame a piece to perfection. Our professionals will help you choose a distinct style finish and presentation to best compliment your project with ease. Scoles is honored to have worked with numerous Corporations, Individuals, Artists, Photographers, Interior Designers, Graphic Designers, Collectors and Gallery Curators who continue to visit our Gallery to choose from our wide selection of attractive moulding styles and finishes. We look forward to working with you in your Custom Framing endeavors.